During the past 24 hours, the models have come into better agreement about how Sandy will interact with several unusual weather features. Those converging events include a large dip in the jet stream into the eastern U.S., a powerful subtropical jet stream moving across the southern U.S., a massive area of high pressure that will be parked over northeastern Canada and southwestern Greenland, and a storm in the Central Atlantic. These features may help steer Sandy right into the Mid-Atlantic or New England. The high pressure area near Greenland, in particular, may act as a block (it's technically known as as a “blocking high”), which may help prevent Sandy from moving out into the open ocean. While it is not unusual to have a high pressure area in that location, its intensity is striking for this time of year. As Jason Samenow of the Capital Weather Gang wrote, the North Atlantic Oscillation, which helps measure this blocking flow, "is forecast to be three standard deviations from the average — meaning this is an exceptional situation." Recent studies have shown that blocking patterns have appeared with greater frequency and intensity in recent years, which some scientists think may be related to the loss of Arctic sea ice as a result of global warming. The 2012 sea ice melt season, which just ended one month ago, was extreme, with sea ice extent, volume, and other measures all hitting record lows. The loss of sea ice opens up large expanses of open water, which absorbs more of the incoming solar radiation and adds heat and moisture to the atmosphere, thereby helping to alter weather patterns. Exactly how weather patterns are changing as a result, however, is a subject of active research. What a coincidence, eh? I need another crash course on interpreting weather maps. And let's hope Sandy either doesn't develop into a massive storm, or doesn't make landfall. But this could be one for the weird category. The NCAR reanalyses indicate a quite sudden shift of high SLP and 500 hPa height from Siberia to Canada in the last few days. Weather? The October mean remains anomalously high over the Kara region. Thanks, Werther. I read all your comments very attentively. It'd be great if people could post a few links of things they keep an eye on (jet stream, polar vortex, snow fall data, SLP at different mb, etc) and perhaps a short explanation. Well, well. Looking at the ECMWF weather forecast maps I see a pretty big low (975 mb) forecasted over Saint Petersburg and a very big low (965 mb) north of Scotland, forecasted for Wednesday onwards. Should get snowy over there. DMI map above shows the centre of high pressure over the Arctic Ocean closely coincides with the centre of the ice pack . Which like top of Greenland Favours high pressure conditions, this was from a slow an gradual build up of ice in tandem with dryer and boundary layer rich air above (for weeks). It is the build up of winter forming where-ever its coldest, started by the unusual shape of sea ice as observed at Minima. In summer minima past the build up was spread over a wider area of the Arctic. Blocking highs shaped like now may be common for many autumns to come. I think it important that so far away events are pinpointed to have an impact somewhere else. Is the way of understanding how weather and climate works. The academic paper is the next link down in Tenney's top list of articles. Deep low pressure North Atlantic systems are quite common, get a grip folks and stop hyping up normal weather, are we going to be remembered as a generation of panic merchants? One thing I looked through this morning was the Polar Meterology Group (at Ohio State) Artic SLP and temp plots for the next five days. They show the past couple of days and forecast three days into the future. For whatever the value of the above - there you are! Apocalypse, " and the low that develops over the Hudson Bay that drifts north towards Greenland, that may pull Sandy northward in its wake...." The low pressure path you mention is not too common. Even less a hurricane or ts hitting Maine. Karl, dough??? the only people panicking are those who want to do nothing. We will be remembered as inept in dealing with an obvious problem, hysteria driven anti science paranoia is shared by fake skeptics. Meantime, Mark Serreze explained why the Antarctic extent was so big this year and all the MSM and syndications of news continue to omit that piece of relevant info. Then, there's news from Aussieland. They lost access to their 46 Million Aus on-ice landing-strip, due melt. Another strip was lost on land, beyond repair, when a shelf broke off causing a wave to wash over the strip. Yes, Antarctic records of note. They're desperately looking for alternate locations to land their jet planes. The Antarctice 4th Ice-Bridge is underway... the're could be a few more wake-up calls packed in there, me thinketh. Took awhile to paint, but stayed up for at least three days passed by over 120,000 cars per day. Cost me about 25 cents to make. Folks will be telling us next that the East Coast of the USA has never seen a tropical cyclone before! To all: please, let me reply first to Karl when I get back later tonight. Karl: you're not getting the gist of this post. Scarlet (freeway blogger), I just wanted to say I've been a fan of your work for years. It's brilliant. Karl, why is it I feel like you are not having the same conversation as everyone else here? Hurricane Irene followed a similar track as Sandy is projected to - up the east coast of the US. But Irene happened in August. The hurricane season typically does continue until late into autumn, but I'm not sure whether there are meteorological factors that mean a track like Irene's or Sandy's is unusual in late October. Wikipedia has plots of hurricane paths for each annual season. From those it's apparent that named hurricanes following tracks along the US eastern seaboard isn't unusual. However they don't tell us anything about when these tracks occurred - which dumps me back in my first paragraph of this comment. 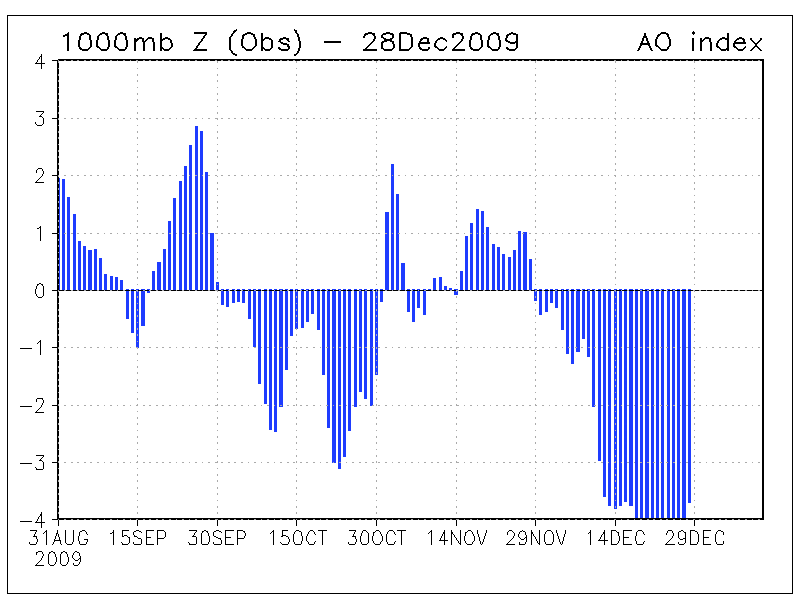 The statement that the NAO is likely to get to 3 sigma down is interesting - does this mean anything for the rest of the winter? Rutgers shows massive advance of snowline over Eurasia from early October to yesterday. Is there a role for Arctic sea ice in the track of hurricane Sandy or the NAO? I don't know. Forgot to add, Irene was in 2011. The gist that folk are trying to somehow link blocking patterns to climate change. Funny how we've only really become aware of them since we've developed the technology to be aware of them. No coincidence there then! On the basis of eyeballing salinity and temperature plots over time, it looks to me like water from the Gulf Stream/North Atlantic drift is intruding farther north than in the past. In the old days, I would have thought this was natural variability, and the result of working with too short a time period. However, these are the new days, and I have to ask if anyone else thinks they see similar effects? I also must ask if anyone has an explanation for the warm east winds along the SW coast of Greenland? Come on! 59F on Greenland on the 25th of October?! They have only had a few bouts of weather well below freezing so far this fall! If that is not weird . . . .
Panic happens when events catch people unprepared. If people see events coming, and prepare, then there is no need for panic. Hi Aaron , of interest is the high pressure over Greenland, which historically is almost always on top of the ice cap, if twin low pressures stabilize over North Hudson Bay and to the South of Nuuk the warming of Baffin bay becomes remarkable in no time at all. This has always happened. What is of interest is the slowness of system movements. The slower they move the greater the warming. Aaron looks like those winds are coming from spain/biscay http://www.wetterzentrale.de/topkarten/fsecmeur.html or http://www.eurometeo.com/english/maps second row second from left ; I've been trying to figure out the cause of the anomoly in mackenzie bay, so have checked the animation[30day] regularly on DMI anomoly and for 3-4 months it's looked like heat is breaking out past SZ and the NSI into the beaufort i assumed this was atlantic water pushing through. Karl prosecutes an iteration of the fake-skeptic meme "it's happened before" (currently the number 1 most-used denier meme). "The climate's changed before" is used to imply either that it must always be natural, or it is nothing to worry about. Responding to "therefore it must be natural": The logic here is that climate change happened before mankind, therefore mankind cannot affect the climate. By the same logic: people died before cigarettes were invented, therefore no deaths can be caused by cigarettes. Responding to "therefore it's nothing to worry about": The logic here is that climate change harmed no humans when humans weren't present, therefore it will harm no humans when we are present. By the same logic, I wasn't there when Chernobyl exploded, therefore I'm immune to radiation. Only Ginny in 1963 hit this late in the season - though two unnamed storms in the 1700's were close. Thanks Kevin, that's very useful for context. In closing your honour, I have shown that my client cannot possibly have started the forest fire he is accused of starting because forest fires have broken out in the distant past long before humanity evolved. Yeah, great info, Kevin. Thanks. Both of you have fallen for inductive reasoning and generalisations which is questionable for those purporting to be scientific. You admit that we have had similar blocking patterns before but your observer bias just will not let you go beyond your stagnant conclusions. Plus you fail to accept the limits and uncertainties of the data available but still you rush to condemn those who would question your thinking. Has science really become the property of the loudest most aggressive blog bully now? Karl, this isn't about Sandy per se. We all know heavy storms have hit the US east coast in the past. What I find interesting is the very negative NAO/AO and the suggestion that this could be forcing Sandy to make landfall. It isn't far-fetched to believe (understatement) there is a link between SLP patterns in the Arctic and the rapid disappearance of sea ice. That huge area of open water could very well have an effect. Like Dr Francis says: How could it not? Explain, please, Karl, how it could not possibly have any effect. And so the people who wish to know more, will look for clues, such as perhaps this blocking event that might make Sandy turn left instead of right. Aren't people allowed to try and know more? Some do it because they are worried (which is no wonder when you look at the long-term graphs). Aren't people allowed to be worried? One weird/rare event doesn't say much, two, three, four weird/rare events in a short time span could be indicative of something going on. A change. Like we saw during the melting season: mega-rapid retreat of sea ice in the Barentsz/Kara and Beaufort Seas, melt all over the Greenland ice sheet, the big Arctic summer storm, the 2007 SIA and SIE records smashed. The freezing season has just started. I think I might be seeing a weird/unusual atmospheric pattern. We might see more. We keep an eye on the snow cover charts, the jet stream, etc. Can we do that, please? Because if you think that we should shut up, I would kindly ask you to leave us alone with our fear and panic. We don't need you to look into these matters. Karl, no one has of yet reached any conclusions wrt to the blocking pattern forcing Sandy to make landfall. First let's see what happens. But yes, we are on the look-out (see my other reply to you). Second, if anyone is bullying here it is you. You're the one who implies we should all shut up, stop speculating and exchanging ideas. We want to know if all that open water and thin ice is causing changes in atmospheric patterns. Don't you? I'm letting your last remark stand, but anymore of that BS and you're out. We don't have time for that crap debate about what we should and shouldn't debate. We're not living in 1995 anymore. It's almost 2013. We want to know what is going to happen to Arctic sea ice, and what the consequences could be. Anyone who is not interested in finding out, should go to WUWT or some other ostrich hang-out. The northeast U.S. coastline north of Cape Hatteras did not experience any land falling October hurricanes between 1900 and 2000. However, 2 minimal hurricanes in the 1800s did make landfall there. One hurricane in 1864 passed across southeast Virginia and onto the Delmarva Peninsula. How Unusual Is This Track? Interestingly, not one of these particular landfalling systems occurred in late October. The two most recent examples occurred in late August. Gloria, Esther and the "Long Island Express" were in late September. The 1869 hurricane was in early September. Not in this list was Hazel, which made landfall as a category four hurricane on October 15, 1954 near the N.C. and S.C. border, taking a quick northward path into eastern Canada as an extratropical storm. A total of 195 were killed in the U.S. and Canada, with severe rainfall flooding in Toronto. What about the "Perfect Storm" you ask? Despite the significant damage from coastal flooding, beach erosion, and high winds, the center of the "Perfect Storm" never made U.S. landfall. While it's the pressure gradient that ultimately drives wind speeds (VIDEO), the lowest central pressure of this historic storm was "only" around 972 millibars. This storm ahead could have a significantly lower central pressure! So it does appear that if Sandy hits the Northeast, it will be a very unusual event for this time of year, and may well be related to unusual events in the Arctic blocking it from drifting into the Atlantic. Let us hope that it does not cause major damage. NOTE TO KARL. Next time you want to hit Neven with a driveby pelting of rotten eggs, don’t break the eggs before throwing them. Check your facts! Had you been paying attention you'd have read that I'm not convinced of a role for Arctic sea ice loss. But I'm willing to be persuaded should strong evidence arise. BTW, Peter Sinclair over at ClimateCrocks is keeping a close eye on Sandy. So long, Karl, and thanks for all the fish. You're always welcome to come back and explain how disappearing Arctic sea ice cannot possibly affect atmospheric patterns. I'd love for that to be true. Environment Canada is forecasting 6m waves riding 4m swells in central Hudson Bay tomorrow driven by 40 knot winds. While the forecast is down to combined heights of 4m near Chisasibi this could cause extensive damage near the mouth of Le Grande River where the traditional (relocated) Cree village sits on a low river island. The Belcher Islands face a combined wave/surge of 5m on Saturday & I'm not sure how much of the islands is more than 5m above sea level. Probably not a big thing from a global perspective, but could present problems for the (few) residing in the area. "You admit that we have had similar blocking patterns before but your observer bias just will not let you go beyond your stagnant conclusions." Strawman argument. Not to mention completely untrue as I never admitted any such thing. "Deep low pressure North Atlantic systems are quite common"
"The gist that folk are trying to somehow link blocking patterns to climate change. Funny how we've only really become aware of them since we've developed the technology to be aware of them." So prove them. Provide a link to a reputable source which documents that "Deep low pressure North Atlantic systems are quite common" and that blocking highs were as common before said technology as they are in the 21st Century. Heck, even compare the 20th Century frequencies to the 21st. It is the abiding hallmark of fake-skeptics to make unsupported assertions that they then not only cannot backup with links to factual sources but then to become agitated when challenged to do so. Fake skeptic ye be, lest you man up and provide said evidenciary proof for ye position. The US media is now calling the storn approaching the east coast FRANKENSTORM. What Karl failed to understand was the presence of a new blue end of summer Arctic Ocean, hard to miss, millions of square kilometres in area. This new ocean has had and will have huge impacts, which will seem weird. Neven nailed it right. Chris, the more pleasant discussion at hand is to explain why this sea water open to the sky is affecting the Global Circulation of the Northern Hemisphere. One has to look at current polar weather, again big but seldom analyzed. There are 2 Lows now hanging about the Arctic ocean's remaining sea water. They are sluggish, as if they are in no hurry to leave a great 3D thermal dynamic predicament, horizontally between the ice and water, cold vs warmer atmospheres. and of course vertically (like Sandy will be). I have seen this before, namely the very cold UK December of 2010 was caused in part by a warm cyclone on the Gulf Stream NE highway turning left to Hudson Bay being wide open. While over Hudson Bay it didn't move fast for the same reasons cited above. The blocking high pressure anti-cyclones first appeared at the Pole over the sea ice pack consolidating winter. In the past they would have rushed downwards cooling out the South while more highs would be created over the thick Arctic Ocean ice, instead they hang about the cyclones enjoying the water, these Lows glue the Anticyclones next to the Polar region, there is not enough winter about. Meanwhile thursday saw record high temperatures here in Ontario: 24C in Wiarton (on Lake Huron) and over 20C from Toronto to Sudbury. Weird indeed to be so hot when the CBC warns that the Snowicane is coming. According to Uni-Bremen the freezing rate is slowing down and the extent already under the 2007 extent. Whereas according NSIDC the freezing still is peeking and well above the 2007 extend. It is not only Uni-Bremen that show this, in your opinion phenomenon, you are almost like JB when using charts! The forecast track for Sandy that the models are showing would be extremely rare, if not unprecedented. As The Weather Channel reported on Thursday, only six hurricanes with surface pressures as low as Sandy is projected to have (the lower the pressure, the stronger the storm) have moved within 200 nautical miles of the East Coast north of Virginia Beach and then made landfall. The most recent of those storms were Irene in 2011, Hurricane Bob in 1991, and Hurricane Gloria in 1985. None of those storms struck during late October, however, and the Perfect Storm was not quite as strong, judging by its lowest surface pressure, as Sandy is projected to be when it nears the Northeast. Forecasting the intensity of Sandy as it moves northward is a particular challenge, because the storm will be interacting with powerful jet stream winds aloft that are associated with an outbreak of Arctic air that has brought snow to many Western states, resulting in Denver’s first snowfall of the season on Wednesday. Typically, such a jet stream setup would help sweep a tropical storm or hurricane out to sea before it could threaten the U.S. However, in this case, the weather pattern across the Atlantic is boxing Sandy in as if it were facing a giant sea of bumper cars. A massive dome of high pressure near the Canadian Maritimes and Greenland, along with a storm in the Central Atlantic, are likely to combine to deflect Sandy back toward the U.S., according to most computer-model simulations run during the past 24 hours. While it is not unusual to have a high pressure area near Greenland, its intensity is striking for this time of year. As Jason Samenow of the Capital Weather Gang wrote on Wednesday, the North Atlantic Oscillation, which helps measure this blocking flow, "is forecast to be three standard deviations from the average — meaning this is an exceptional situation." Hurricane Sandy may be an example of what can happen when a blocking pattern that may have been supercharged by sea ice loss occurs at just the wrong time — when a hurricane happens to be moving up the Eastern Seaboard. I'm not too suprised by the slow down some of waynes posts showed he had little confidence in the refreeze, made me think it was snow settled on a sub zero ocean rather than a -11 refreeze, though with it at -26 above the 'snowpack' any setback would likely be quickly reversed. We may yet see a consolidation take place, if it gets stormy. The Arctic is on the front of one of Denmark's (JP)largest newspapers today with the story of the consequences of what the lack of ice in the Arctic Ocean may create. It is not on their net edition though? The Sandy discussions hold extra interest when you're watching to see whether it might come your way. "If the Arctic region becomes warmer in the future, do you think that will have no effects, minor effects, or major effects on the weather where you live?" * No effects on weather where I live. * Minor effects on weather where I live. * Major effects on weather where I live. About 60% answered "major effects," I did not expect that. The question will be repeated on some future surveys to watch for possible change. Although text is fine and content based on solid sources, the graphics are somewhat misleading. The main message is: Colder winters due to global warming. Negative territory? That's not negative territory. Although not close to strength (Hazel was a cat 4) a very famous storm in Ontario history was HUrricane Hazel See: http://en.wikipedia.org/wiki/Hurricane_Hazel. It was earlier in Oct but had run into a similar high blocking pattern and what is a little concerning due to run into a cold front that is hitting here today. Now what could be interesting is how this storm could move things around as far as the Arctic is concerned. If Sandy gets far enough NW, it could decide that its only move left is to exit north of Greenland, or just decide to park itself until it dies down in which case you are faced with a jet stream that will look very odd for a while. In line with your request for what we look at, I look at two places which I don't see mentioned on here. and solar ham recently solarcycle24.com. It is nice to track what the solar output is when watching events. The impact of CO2 amplifies solar impact so we should see more impact in the Arctic when the solar flux is high in spring/summer months. That was true this year. They are just part of the overall picture but I like to know what is happening before the press report it. What do mean with Nope? My sister was born in Newport, Rhode Island on October 15, 1954 in the middle of hurricane Hazel while my father rode it out in the Atlantic on a navy destroyer. Sandy is expected to hit the east coast (most likely New Jersey) during high tide. New Jersey high tides are nearly 5 feet higher than low tides. The most conservative estimates predict a 1 meter rise in sea level by the end of the century. Others estimate a sea level rise of 2 meters or more. We should consider the coastal impact of Sandy as an example of the "new normal" by 2050. Storm surge could be devastating and state and federal officials should plan for these to occur routinely within 30 years. According to my Oxford Dictionary it means: "informal variant of no" - so you should not expect an online version of the news story you refer to. Somewhere in S.E Asia there's a freak butterfly just minding it's own business. I have now referred twice to the question mark at the end of your Oct 26 14:00 post. That might be the butterfly we are looking for! *Frakenstorm was chosen because it took pieces of several weather systems, to create a monster of a storm. cool work! I don't see a way to get in touch with you..? I would like to help the effort out. You can contact me through the Climate Watch site linked to from my profile. Is this survey being published? It sounds very interesting. Again the weather systems are moving "slow to stop" in the Arctic. Its important to study the reason why the Anticyclones "wall" facing Hurricane Sandy were created. Most meteorological presenters stop at that, they say there is this High pressure block, without going deeper. The creation of high pressures in the Arctic does not come about just like that, frequently they exist because its cold, there is very little moisture hence no clouds and finally they subsist almost exclusively with one boundary layer (a substantial inversion). High pressures always co-exist with lows and vice-versas. Lately over the Arctic Ocean yclones have been hanging over open water. And from there the tropical hurricane meets the pressure wall created from the Arctic. Geoff, There can be many combinations of Hurricane pathways, I don't recall a 91 hurricane /Northeaster hitting the East coast similar to the current one. My focus is on the origins on the Anticyclone block, Having a map of the 91 event would be nice. The Perfect Storm is the popular one because it is the most resent of this type of setup. The problem I see with this comparison is that it was over water which changes the interaction of systems quite a bit. That is why I picked Hazel as a better example. Although not quite the same, location and systems in play are much closer comparison. The interesting part of it as that it will come 3 weeks latter in the season. If you look at things from where plants and animals are now as to what they were 60 yrs ago, that shift would line up with the changes in climate. I agree with wayne in that you are now going to see stationary highs and lows as the norm, which could mean that you will see far more hurricanes either pushing out and wondering around the mid Atlantic or making funny left hand turns into the upper NA. Environment Canada is showing a large cyclone centered on Hudson Bay with a low of 969. A gigantic hydro facility just to the south provides most of the power to New York. The power lines run through hundreds of miles of boreal forest. If NYC were to lose power in the days prior to Sandy doing it's damage the results could be horrendous. The storm is centered north of James Bay, but swells and wave action could be rough from Chisasibi north, particularly on the Belcher Islands. Nothing weird at all, but still unseen as the Kara Sea hitherto still had important and large ice shelfs left at the end of Summer. Do have a look at the continental Russian cost line between Dickson and Severnaya Zemlya, that is between the estuaries of the rivers Ob+Jenissei and Severnaya Zemlya. As we all are aware of, fresh water tends to float on top of seawater while developing large and thick layers of itself. For example that's why Fernão de Magalhães discovered the Amazone river already 200 km out of the (now) Brazilian coast. Ob and Jenissei stil are pouring enormous quantities of fresh water into the Kara sea. As fresh water freezes much more quickly than seawater, we fairly can assume the separately formed ice field we see at the mentioned coast line has been formed on a pile up of fresh water. Last year the fresh water coming from Ob and Jenissei moved rather quickly to the Canadian Archipelago. Rests to be seen if it would be like that this year too. I've been following hurricanes for a lot longer than I've been following sea ice in the Arctic. Normally I'd expect the likes of Sandy to head in this direction and provide some potentially nice swells on the north coast of South West England. A sudden turn to the West is certainly not usual behaviour. Since my profession involves keeping the lights on, I've also been monitoring how the lights go off in the United States in these circumstances. It'll be interesting to see if all the lights go off in NYC this time around! Following Sandy around the blogosphere I've just discovered that Jeff Masters now offers a Wunderground API. I've just signed up for it, but whether it allows me to easily produce "a map of the 91 event" remains to be seen! Speaking of weird, I was looking at my arctic sea ice graphs folder, before I checked on this site and when I did, I discovered Neven made this thread posting the same things I thought were odd. The first two images Neven posted were things I thought were weird, but the third image was a hurricane aimed at my front door. I was so busy arguing with Denialistas on WUWT, that I wasn't checking the news. Speaking of weird, the first post I posted on this site was lost in cyber space and it was an appeal to scientists to stand up and refute the Denialistas. I'm asking Scientist or anyone concerned about their environment to go to contrarian sites and refute the nonsense. Since you mention that sort of weirdness Ggelsrinc, I recently found myself in an online conversation with Professor David MacKay FRS, Chief Scientific Advisor to the UK's Department of Energy and Climate Change, whilst engaged in a heated debate with some local denialistas! I agree with you Jim, I don't recall anything similar to this current hurricane vs Anticyclone blocking event. Only way to check is for someone to find evidence. Ggelsrinc WUWT offers nothing but BS, is a large waste of time to deal with these guys, however its good to keep track of their "prediction" record which is worse than the fake science they spout out. Twemoran, is rather interesting that this James Bay 969 mb Low leads the hurricane path creating a wake of low pressure heading North. My take is that the wall had a weak spot and the the Jet stream pushed this Low to punch through. "On October 28, 1991, a extratropical cyclone developed along a cold front which had moved off the Northeast coast of the U.S. By 1800 UTC, this low was located a few hundred miles east of the coast of Nova Scotia. With strong upper air support, the low rapidly deepened and became the dominant weather feature in the Western Atlantic. Hurricane Grace, which had formed on October 27 from a pre-existing subtropical storm and was initially moving northwestward, made a hairpin turn to the east in response to the strong, westerly deep-layer mean flow on the southern flank of the developing extratropical low." Thanks Jim, seems like it was a merger of cyclones but no high pressure wall. When I first saw that mslp chart, my thought was 'that makes no sense'. But obviously things are a bit different in the Northern Hemisphere. in Australia this kind of system would be an 'east-coast low'. http://www.ecmwf.int/products/forecasts/d/charts/medium/deterministic/msl_uv850_z500!Wind%20850%20and%20mslp!72!North%20America!pop!od!oper!public_plots!2012102700! !/ Upper level conditions also look quite favourable for it to maintain strength. Negative AO will favour 'cut-off' systems, the question is does the lack and/or distribution of sea ice encourage the negative AO? The survey with the Arctic/weather question was done just a few weeks ago, so I haven't written it up yet. It's part of a longer, ongoing series of Arctic change questions I've been putting on public opinion surveys, so you'll hear more about this. If there's interest I could do posts here from time to time, about the socially constructed ice. "Did the Arctic ice recover? Demographics of true and false climate facts"
I should have the nicely formatted final version in a few weeks if anyone wants to email me for that. "Trend lines that were way below all other years for weeks on end have returned to the pack..."
Just a note to say that this is not the case with, for example, DMI or IJIS extent. Most recent values for both are second-lowest for the date, higher only than 2007. Geoff, I've just read the article. I'm not seeing any problem with it, to be frank. It's too early to draw any conclusions as of yet. After the storm has passed it will be time to do an autopsy (sorry for the morbid reference) and then perhaps compare that to autopsies of comparable storms. Some folks are already discussing this below. Unfortunately I lack the knowledge (and don't have the time to gain it that quick), but I'm sure comparisons will pop up, if the storm turns out similar damage-wise as the other big ones. 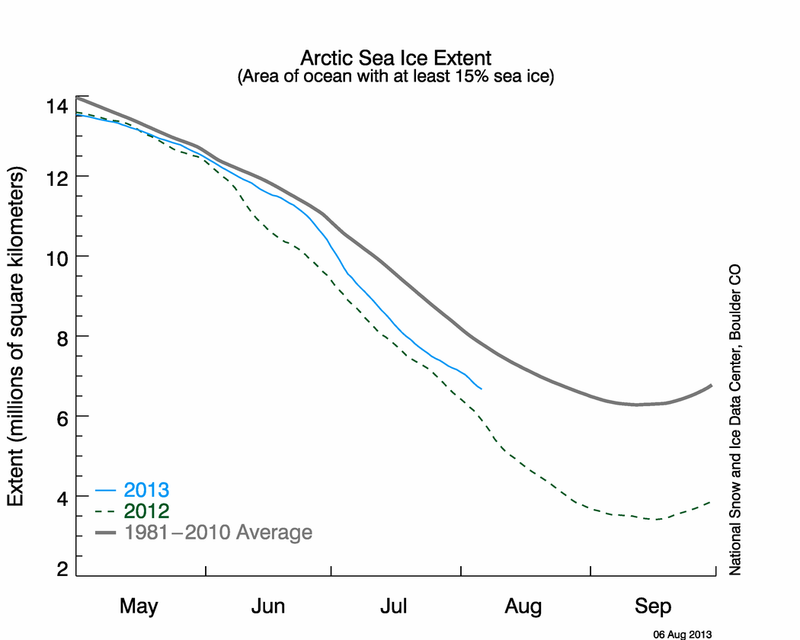 Of course, what I'm most interested in is the role the Arctic sea ice might be playing in all of this. Wayne has some very interesting speculations (thanks, Wayne). warm North Atlantic water enter through Fram Strait since at least 2000 – reaching the Laptev in 2004 and maybe contributing to a 2-4 K increase in SAT across the Arctic this century. Well known sea ice record reductions in 2007, 2010 and 2012 have contributed to an estimated 80 % reduction in sea ice volume and more open water. Actually, a closer inspection of diagrams in fig 4 shows warm surface lenses in the Laptev and East Siberian seas closest to the coast since about 2005. Whether these are freshwater lenses or upwelled Atlantic water is hard to tell on the basis of this paper alone. However jumping to maps of SST anomalies in the Arctic this year – see http://ocean.dmi.dk/arctic/satellite/index.uk.php - (and remember to change the view to SST anomaly mode before browsing through the last 30 days of anomalies) you get a consistent “Triple-B” SST anomaly pattern. The B’s stand for Barents-Laptev seas, Beaufort Sea and Baffin Bay core areas of positive near-shore SST anomalies throughout the last month. As explained in a previous post, these persistent anomalies may have been maintained in part by katabatic winds. This “Triple-B” pattern is also visible in the atmosphere as described by Wayne yesterday at 04:48 – and explained by him today at 04:37 as: “…stubborn persistent Lows.” The concept of “blocking lows” in the Arctic is really weird! Eventually the Triple-B lows will run out of ocean energy and move on. Until this happens, the good folks in the Nor’eastern US better batten down the hatches. Last time I checked, the DWD had 10-12 meter waves washing Wall Street next Tuesday. Q What was discussed and/or interests you from the ACE meeting? 1) What are the attributable human influences for an observed weather or climate event at some level of confidence? 2)What are the most likely causes for an observed weather or climate event at some level of confidence? The importance of the meeting was that all these people came together and started a dialog, rather than an exact decision of what needs to be done and how to develop event sets. There was a consensus that we cannot provide attribution studies of an event within the 24 hours news cycle or with a quantified level of uncertainty defendable in court, hence the negative results that came across in the nature editorial. However, from a scientists perspective the meeting quite positive outcomes which are e.g. : a) with the methods and models currently available we can make robust attribution statements at least on the sign of the change in risk for many extreme events; b) we can provide useful information for insurers; c) we can provide useful information for NGOs to develop useful adaptation measures. The main thing to do as a scientific community and from a scientist perspective is to develop an accepted and comprehensive method of validating the models used in attribution. Q. With Hanna et al  and Overland et al  suggesting arctic ice retreat are perhaps beginning to affect weather patterns, are calculations of fractional risk of weather events that do not adequately take account of ice retreat going to be hopelessly flawed? Is this going to be particulaly important if we rapidly move towards a seasonally sea ice free arctic over the next decade as more people seem to be suggesting with this years new record low arctic sea ice? A. Yes, there are studies suggesting that sea ice is important for a lot of weather events in particular in Europe, thus we are in the early stages of planning how to do attribution studies on the influence on sea ice. However, sea ice is one factor of many that might lead to changes in the risk of extreme weather events in Europe, it is not at all clear that this is the dominant factor, the next planned study will e.g. look at the storm tracks, which are also thought to be potentially of high importance for European weather. Our models use observed sea-ice fields so we do accurately model the sea-ice retreat for historical simulations, therefore we do address changes in sea ice content by comparing accurate historical simulations with counter factual simulations. This is an advantage of our set-up using an atmosphere only model with prescribed ssts / sea-ice instead of coupled models (atmos / ocean) which are poor at producing sea-ice consistent with observations. Thus we do not think they are hopelessly flawed, but can say qualitatively a lot about changing risks. However, for a comprehensive quantitative analysis it would be preferable to explicitly include the influence of sea ice in the attribution studies. Future projections of sea-ice are notoriously difficult. The general trend is to less sea-ice but many other factors will influence how much sea-ice is present in the summer of any given year. Attribution studies have to take this into account, rather than just comparing single years, they should try to compare some "mean state" over a particular time period, between two scenarios. Hurricane Grace was much further into the Atlantic when faced by a singular North Atlantic Ridge (data is sketchy) while merging to the North'easter of 1991, the 91 North'easter came from Canada. The name Grace indicates a slow hurricane season. Second the general circulations as compared with today is dissimilar. 2012 has a broad wall of High pressure spanning North America only pierced by a Cyclone heading North fast which is leading the way for the current hurricane and North'easter merger to slam strait on against towards the NE American coast. BBC didn't quite do all its homework. Thanks for your earlier comment about the BBC report 'Frankenstorm' bears down on US east coast. "I've just read the article. I'm not seeing any problem with it, to be frank.". I read the BBC climate reporting with a jaundiced eye. I suspected the "perfect storm" reference in the article was another example of the BBC downplaying climate change - a possible example of "Don't worry it's happened before". I wasn't sure it was a good enough example to add to my tweets to the BEEB. To conclusively show that the BBC has the wrong balance on climate change requires in-depth study that requires much more resources and time than I have available. But the tweets to the BEEB are there for me to follow it up if I ever have the time as well as an attempt to bring the issue to their attention. I do detect some shift in BBC reporting: There is now less of the false balance between climate scientists and sceptics but, except for Peter Wadhams and sometimes James Hansen, they don't seem to examine the climate-is-worse-than-the-official-line issue. From reading your blog I am sure you agree that the official line on climate is way behind the real world. (e.g. Models are improving, but can they catch up?). I would like the BBC's new balance to be between the officials, like the IPCC, and those that can put the arguments forward that think climate change is much worse - and much more complicated. I think your blog should be part of this balance. What impression do you and others have on the BBC's climate reporting? Should I save my effort and stop tweeting the BEEB? I have plenty of other things to do. Geoff, I stern note about the misrepresentation they have done while comparing the perfect storm of 1991 erroneously with 2012 Hurricane Sandy merger, very unlike 91, slamming the East coast dead on would perhaps prompt a better beeb presentation. Geoff, I don't read the BBC often enough to discern any direction of or policy in their reporting, but it's always good to be on the look-out for that horrible false balance thing in the media. Again, let's see what and how they report if this storm turns out to be among the biggest on record. And that goes for all the media. I think your blog should be part of this balance. Not just anger but anger at 01:33 in the middle of the night! Two max temp record days in a row at Ilulissat on the 25th and the 26th of October. Meaning the Ilulissat glacier remains under direct attack by rainfall and temperature. And even at Kimmirut the temperature has risen above freezing point. Probably within 24 hours the warm winds will be bended from Greenland towards Labrador, New-Found-Land, Quebec and Hudson bay. Depending on the caprices of Sandy of course. Comparing the areas of ice, and land to the DMI map above, Seems that the lows 'want' to sit over the 'warm' / convection favouring open water, while the highs are sitting on the cold ice and continents. This would tend to be a self-reinforcing situation. Whats interesting is how 'skewed' the polar cell is. It almost looks like there are just two cells over the US, a tropical cell, and a polar cell. I wonder if, when the ice melts out completely, we will see a new atmospheric circulation system develop with a low over the polar sea, and highs over the surrounding continents. This might have the effect of keeping the arctic cloudy and relatively ice-free over the winter. Sunkensheep . Well understood. If you look at your polar model forecast, the Lows will be maintained over Beaufort (almost continuously) , Kara and Arctic Atlantic sea areas for at least 7 days exactly where the open water is. With amazing low pressures of at least 1020 mb at center. Translating into colder weather over NW Europe and warmer steadier weather elsewhere. Steady Northern Highs also will cool Siberia and NW North America because they will be compensating for the Lows stubborn non stop stance. The projected track of Sandy is not just unusual, it's essentially unprecedented. Try going to the link to the NOAA historical database graphing program provided above by Apocalypse4Real. When you plot all tracks of all Cat. 1-5 hurricanes that moved within 200 nm of NYC between 1851 and 1911, you see that all but one was moving from the southwest to the northeast quadrant. The only exception is a Cat. 2 hurricane from September 1903, which had a slight SSE-NNW orentation. There is nothing remotely like the sharp left hook and coastal approach from the SE being predicted for Sandy. Not only is this track indicative of something extremely unusual in the steering flow, it's very problematic for NJ/NY because it'll slam water toward the NY harbor from almost a right angle. It's also giving forecasters fits because there's no real precedent to draw on. The 1991 Perfect Storm is the closest analog to the westward motion and the hybridization process--but of course, it never came close to striking the U.S. coast, and this system looks to be stronger. I fully expect some very unusual consequences. BTW, I'd like to thanks Neven and everyone for this superb blog, which I've been reading for years (and giving an occasional shout-out to from my NCAR AtmosNews/Opinion blog-style columns). I've learned an enormous amount, and I now consider this an indispensible part of my weather/climate news diet. Mille grazie! Wow - How do you follow that! The storm previously over Hudson Bay has weakened some and moved north west. 6m wave/surge in Baffin Bay is slamming the north west coast of Greenland. Yesterday there was rain in most of this area & usually northern Baffin Bay would be frozen. I'll check the new weather reports from Joe Island & Han Island tomorrow, but suspect they're showing some fierce gusts. I hope things don't play out as expected with Sandy. I've been watching CNN for a few hours and they haven't mentioned a thing.